Great information .......... Cinnamon and Honey ! Drug companies won't like this one getting around. Make a paste of honey & cinnamon powder, put it on toast instead of jelly & jam, and eat it regularly for breakfast. It reduces the cholesterol and could potentially save one from heart attack. Also, even if you have already had an attack studies show you could be kept miles away from the next attack. Regular use of cinnamon honey strengthens the heart beat. In America and Canada, various nursing homes have treated patients successfully and have found that as one ages the arteries and veins lose their flexibility and get clogged; honey and cinnamon revitalize the arteries and the veins. Arthritis patients can benefit by taking one cup of hot water with two tablespoons of honey and one small teaspoon of cinnamon powder. When taken daily even chronic arthritis can be cured. In a recent research conducted at the Copenhagen University, it was found that when the doctors treated their patients with a mixture of one tablespoon Honey and half teaspoon Cinnamon powder before breakfast, they found that within a week (out of the 200 people so treated) practically 73 patients were totally relieved of pain and within a month, most all the patients who could not walk or move around because of arthritis now started walking without pain. Those suffering from common or severe colds should take one tablespoon lukewarm honey with 1/4 spoon cinnamon powder daily for three days. This process will cure most chronic cough, cold and clear the sinuses, and it's delicious too ! Honey taken with cinnamon powder cures stomach ache & also is said to clear stomach ulcers from its root. 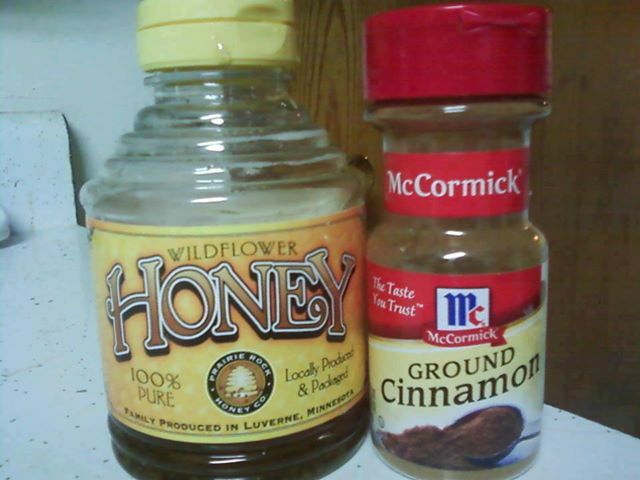 Daily use of honey & cinnamon powder strengthens the immune system & protects the body from bacterial and viral attacks. Scientists have found that honey has various vitamins and iron in large amounts. Constant use of Honey strengthens the white blood corpuscles (where DNA is contained) to fight bacterial and viral diseases.